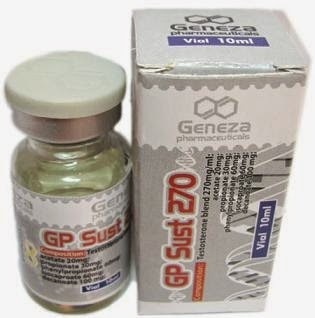 There are a lot of questions about GP Sust 270 dosing. Due to sustanon's GP Sust 27 of esters, it is a little difficult to wrap your head around sometimes. Hopefully this will help clear up some of the confusion. Sustanon is a Testosterone Blend. Each Lab has its own mix, but generally speaking it will contain 3 to 5 types of Test. Looking back quickly at the half life of the esters of test, you see that half of those used are fast releasing (around 3 days) and half are slow releasing (at least 10 days). Now before anything else is explained, let compare GP Sust 270 cycle to a Test Enanthate cycle with a Test Prop kickstart. Typically with a Test E cycle, you start to feel the test enanthate kick in sometime around the 5th week, so I will use week 5 as the Test E fully kicked in for my example. It is clearly shown here that for weeks 1 to 5 we are taking a total of over 1gram of test. This is split into 500mg Test E which slowly pools for weeks, and 500mg of Test P which is used up within days. This should be fairly straight forward so far. Onto the more complicated stuff now... What we are looking for in a cycle is a gradual build-up of test (for about the first week), followed by several weeks where we want to keep blood levels as steady as possible (usually 500mg/week of test), followed by a gradual coming-off of test (again, about a week of the test slowly leaving the body). GP Sust 270 is an excellent drug to keep these blood levels steady if you inject it properly, and you only need to use 1 compound instead of 2 like in our Test E/P example. The tricky part is figuring out how much test is actually in the body with all these various esters in there. this consists of 110mg fast esters and 160mg slow esters. So if we are looking for 500mg/week for these first 5 weeks (using EOD injections) we can easily do this by taking 1ml per injection. As the longer esters begin to kick in, you can drop the dose. If at week 6 you drop to 500mg TOTAL test/week (since both fast and slow esters are both active at this point) we drop to a little under 2ml/week, which works out to 1/2mL EOD. This is good enough, but if you want even better blood levels, you will need to taper down the test over the span of a few weeks when the slow esters begin to kick in.... lets say weeks 4-7. During this time we want between 1ml EOD and .5ml of test EOD....obviously this is .75ml EOD. What does this all give us now? Hopefully this is easy enough to understand. The 1grm/week of GP Sust 270 may look intimidating at first, but by now you should realize it is no different from what the Test E/Test P doses are.